I'm pleased as punch to announce that Marion Zimmer Bradley's SWORD & SORCERESS 32 is now available for purchase. The reason I'm so pleased is that I have a story in it! 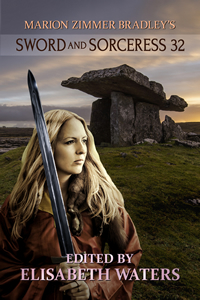 Sword & Sorceress 32, edited by Elisabeth Waters, was published November 2, 2017 and is entirely suitable as a gift for Christmas, Hanukkah, Kwanzaa, Twelfth Night, Winter Solstice, Yule, etc. It is available in trade paperback, and for iBook, Kindle, Kobo, and Nook. Grab a copy for yourself! Makes a great gift, too! No, really.